This idea has been on my mind since purchasing the car in November 2017. It is a really fun to car to drive and I always thought it would be cool to have a way to push the electric range a little further. 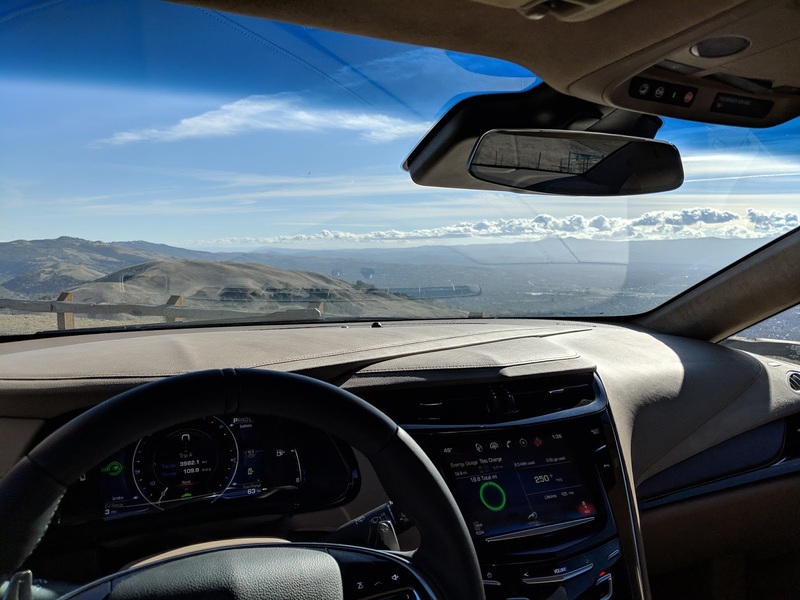 Don't get me wrong: the gasoline engine is perfectly capable of driving the car as far as I need to, but this just seemed like an extra challenge and a great way to learn about lithium battery energy storage systems. I started by researching high voltage DC-DC converters. There are very few options on the market and usually with a power envelope that is too small or a price that is too high. 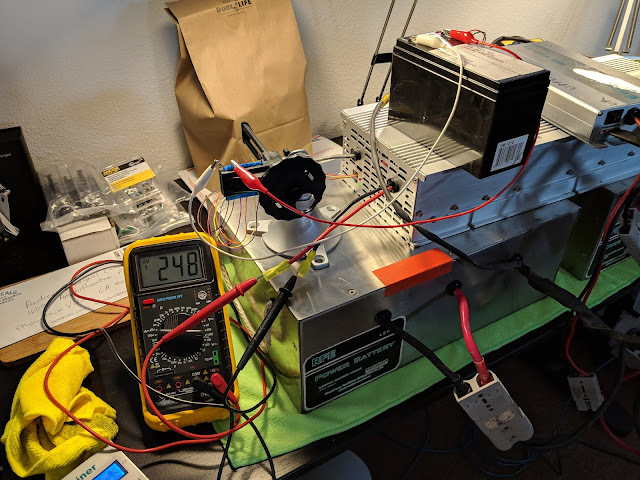 One such example comes from TDK Lambda: the EZA2500 supplies a peak power of 2.5kW which is a little on the low side for this application, but could work. The unfortunate reality is that the price is just too high with an MSRP in the thousands of dollars. For a crazy garage experiment, that is just too much money to spend on something that may not even work. I kept my hunt for a suitable DC-DC converter alive and would periodically check dubious sources like eBay and Alibaba. One fine day, this Enginer PHEV Conversion Kit popped up. It was actually two kits! The components were in a slight state of disarray but everything seemed to be there including a DC-DC converter and four 2kWh LiFePO4 battery modules. This was all available at the bargain price of just $500, local pickup in Los Angeles only. 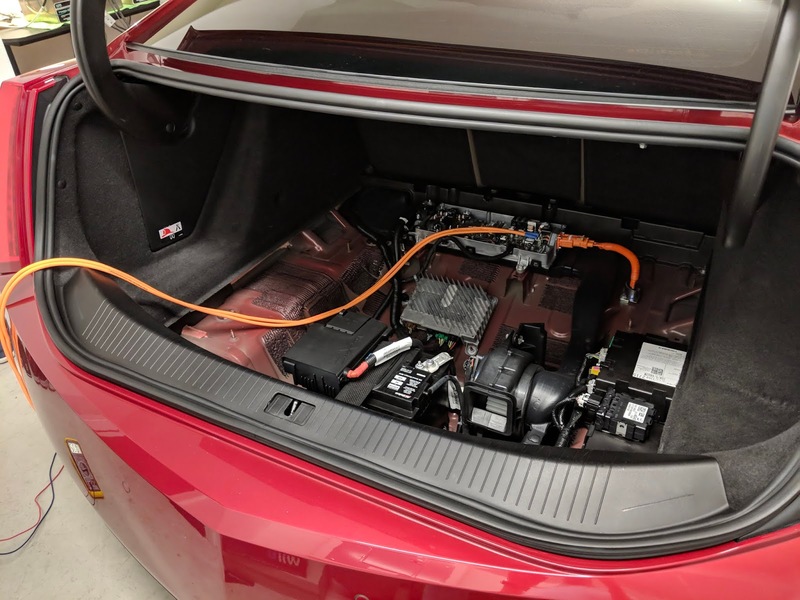 I did some research on this kit and found that it had been installed in a Nissan Leaf as well, which has the same 96S LiMn2O4 configuration that the Chevy Volt and Cadillac ELR have. This sealed the deal for me: prior art of a working installation in a similar vehicle. I offered asking price, the seller gladly accepted and I planned a trip from the San Francisco Bay Area down to Los Angeles and back in one day. I drove my Tesla Model S, supercharging 3 times while eating and resting. I left my house at 5AM and returned home at 11PM, with nearly 500lbs of cargo in the trunk. I went straight to bed and unloaded the car the next day. Some of the components were in obviously poor condition. The system actually came with 5 battery modules, but one was in very poor condition. I recycled it. The other four were in great shape. I benchmarked them and measured health to be around 85-90%. There was also a BMS that didn't seem to do much of anything. I recycled any components that were damaged. 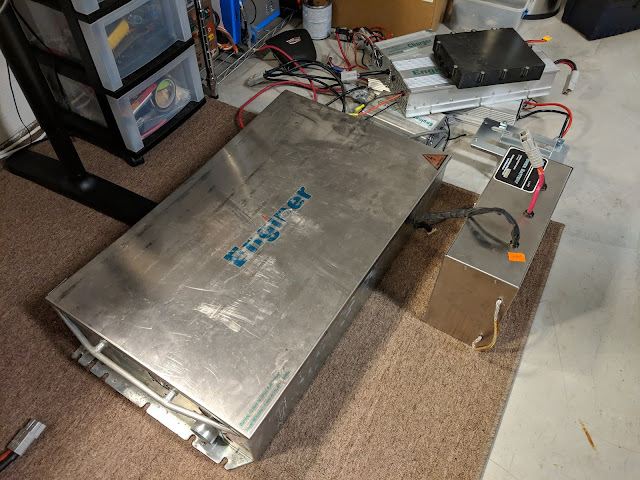 I disassembled the trunk of my ELR and removed the lid from the APM (Accessory Power Module). This is a 12V DC-DC converter that supplies power on the 12V bus from the 390V bus. You can think of this as a replacement for the alternator present in most cars. I spent a couple of hours reverse engineering the pinout of the Enginer DC-DC converter to find the enable line. One of the components missing from the auction was the on-off switch. It wasn't too hard to find that there is an internal relay that is engaged with 12V. I used an external sealed lead-acid battery to power the relay in the converter. It sprung to life and displayed 248V on my multimeter. I was able to tune this voltage up and down using some trimmers inside the converter. I used four incandescent lamps as a dummy load for brief intervals to calibrate the instrument. I also verified that the capacitors on the output stage are rated at 400V which means they can tolerate the high voltage of the car. With one arm behind my back, I carefully wired the output of the DC-DC converter to the HV bus of the car. I connected the 12V battery to engage the converter and... well.. nothing really. 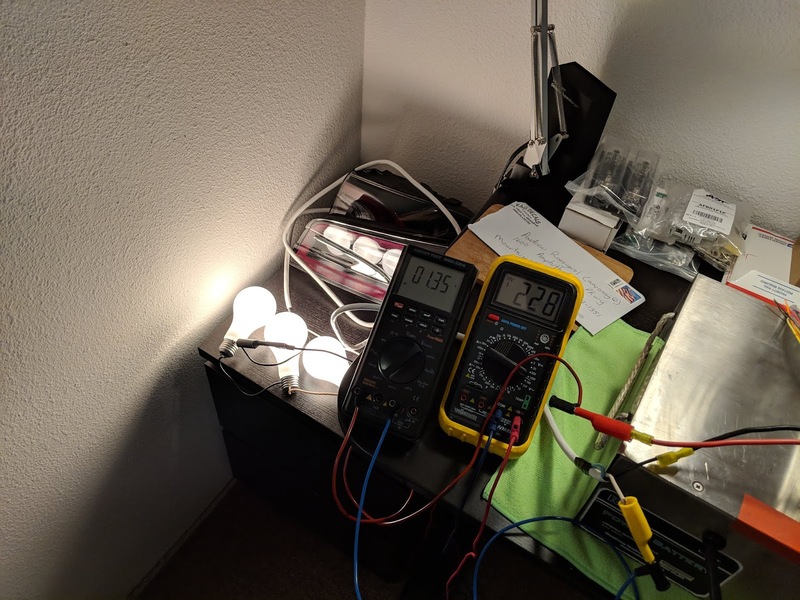 I had my multimeters connected to measure voltage and current. I found that the voltage was at 390V but no current was flowing from the DC-DC converter into the car. I tried adjusting those trimmer potentiometers and suddenly current began to flow, but not very much. I was barely able to get the current over one hundred milliamps. I began to entertain the idea that there might be a diode on the HV bus to prevent current from flowing backwards into the pack. 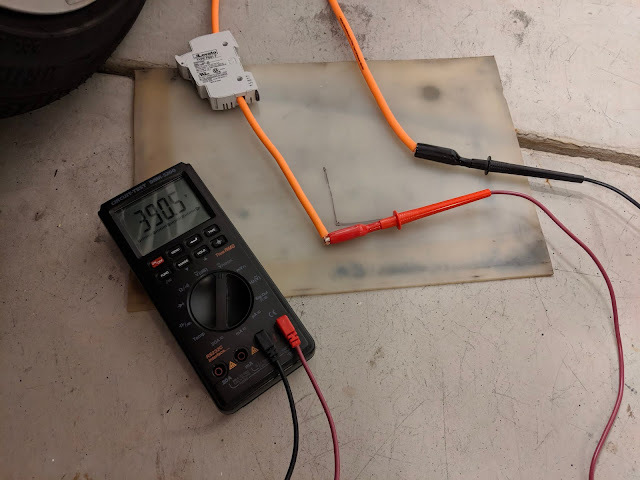 I decided to modulate some 12V loads in the car to see if I could change the amount of current flowing from the DC-DC converter into the car. Sure enough, engaging the fans at full speed, both heated seats and the rear defroster allowed the current to increase, but not by much. At this point, it was obvious that I was doing nothing but converting 48V to 390V, then back down to 12V to run the various loads in the car. Not a single electron was making it back into the high voltage battery of the car. I gave up on the project and put the idea to rest for a few weeks. I don't give up easily. My work cooled off a bit at the office and I had some time to think about this again. I considered every possible way of connecting to the high voltage bus of the car but ultimately decided that any approach would be a little more permanent than I would like. I didn't want to modify this ELR. It is a nice car to begin with and quite rare at less than 3000 total units produced. This prompted the idea of simply building a portable L2 charger. It would be completely isolated from the car and could easily be taken out when I ultimately get bored of this project. I sketched out some ideas in my notebook and decided on a simple wooden frame to hold the batteries and electronics together. Wood is easy to work with, relatively light and should be plenty strong. The basic idea was to build a simple frame with two rails that have spans across the middle holding the batteries, inverter and wiring. I used threaded rods to hold everything together so that it could be disassembled and reassembled inside the car. The other advantage of using threaded rod is that the construction could tolerate some small errors. I loaded the batteries onto the frame and found it to be perfectly strong enough for this static load. I also stood on top of the frame and found no issue. The obvious difference between assembling this on the floor and in a car is that the car is in motion, but so far everything has been holding up well. I decided on an inexpensive 4kW inverter from eBay. I checked reviews on YouTube and found that people were happy with the quality. The car can charge at a peak 3.3kW so there is some margin left over. I chose a single phase inverter to keep the cost down as I didn't plan to use this with any other appliances. I added an Anderson SB 175A connector to keep the inverter modular and wired the NEMA 14-50 connector. The one caveat here is that the NEMA 14-50 connector is a split phase connector and this is not a split phase inverter. The J1772 connector found on American electric vehicles has only a line and neutral pin which is derived from the two outer hot pins of the NEMA 14-50. I decided to simply not connect the neutral line of the connector. This could use a warning sticker that this is only for use with an EV charger as this is not to any code or specification. I painted the entire frame black and mounted the inverter on threaded rods next to the battery mounts. The wiring board was also prepared to be mounted vertically between the inverter and batteries, The quick black paint job turned out to be perfect for the project. The next step was to start on the DC wiring. I used two bus bars for 48V and Ground. The battery modules will be wired in a 2S2P configuration (which is ultimately a 16S2P battery). The bus bars allow the parallel connection between the batteries and the rest of the components. The battery management system uses a shunt to measure current in the pack and I opted for a 250A system fuse. During this entire build, I spent hours pre balancing the batteries. It was quite clear that they were severely out of balance, but thankfully all cells were within a healthy voltage range. I used my iCharger 4010 Duo to balance two modules at a time. This took hours to complete. The balance current is limited to 1A which means that the final stages of charging took a very long time as the weakest cells of the packs were charged and excess energy was burnt off through the balance leads for other cells that had already reached capacity. I assembled two wiring harnesses for the Orion Jr. BMS: input/output and cell balancing. The input/output connector supplies power to the BMS and a connection to relays and temperature sensors. The balancing cable is used to measure and balance each individual cell in the pack. I removed several unused pins from the connector to reduce clutter in the installation. Measures all current flowing into and out of the pack to allow the BMS to implement state of charge (SoC) estimation and soft fuses for over discharge and over charge currents. A safety fuse in the event that I do something stupid and short out the pack. Something nasty would happen if a short happened, beginning with perhaps the best welder I have ever seen and ending with fire. It is wired as recommended in the wiring manual after the shunt. A large 250A contactor is used to allow the BMS to switch off the load as needed. This can happen if a fault occurs or if the pack has been discharged. This contactor is too large to be driven by the BMS directly, so it is chained through a smaller relay with a 50mA coil. A small 40A relay is used to allow the BMS to switch off the charger as needed. This can happen if a fault occurs or if the pack is overcharged. It is similar to the discharge relay and allows the BMS to safely enable and disable loads. I used a large circuit breaker as a toggle switch for the whole system. It is a bit overkill as the circuit breaker just applies 48V to a general purpose input on the BMS, which then toggles the load relay. I like the look and feel of the switch and already had it on hand. After all of this was completed, the system could be transferred into the car. So how well does all of this work? I am pleasantly surprised. In one test, I was able to add 4kWh of energy to the car before stopping the test. I will need to do more monitoring and BMS tuning before I feel comfortable putting this system through a full charge and discharge cycle but 4kWh is very promising. Initially I didn't notice much of a difference in handling, but with more driving I noticed that the weight distribution is improved significantly. The Cadillac ELR is a heavy car at just more than 4000 lbs with 61% of that distributed to the front of the car. The ideal weight distribution for handling is 50:50. Adding an extra 280lbs to the trunk seems to have reduced understeer, which is absolutely hilarious. I have no doubt that it has a negative impact on acceleration. The ELR is not a very fast car, so it's not something I would notice. I was able to merge on the freeway just as easily as before. I didn't notice any change in stance, so the suspension seems fine with the added weight. This is not terribly surprising as the cargo capacity of this car is more than 800lbs. It is rather funny to see this cable emerge from the trunk only to be plugged back into the car. I also look forward to lending my first charge to a fellow EV owner. I have a friend who converted a first generation Chevy Volt to the European Ampera model. It will be great fun to snap a picture of an ELR charging an Ampera at the next cars and coffee meet. The thermal performance of this system is still something I am monitoring. The inverter is >85% efficient, but I have not characterized the exact performance I am seeing. In any event, assuming 15% loss, this would result in 400W+ of radiated heat. The trunk should be left open to vent the system. The BMS is also configured to stop the load at 40C, but this may need some tuning. The summer will certainly bring increased temperatures. The Orion Jr. comes with comprehensive software for configuring every aspect of the system, reviewing faults and streaming live data. It is impressive software that runs well on my ThinkPad under Linux. I am using a 600W eBike charger from Amazon that is working well so far. The only downside is that it will take more than 16 hours to recharge this pack at a 600W charge rate. I hope you enjoyed this project of mine. I certainly learned a lot, which is always a goal when spending time on projects like this. It is clear that the practicality of this system is limited given that it consumes most of the trunk space. This is a weekend car though, so I am happy with the tradeoff. I look forward to attempting some longer electric-only road trips in the ELR and continuing on the quest towards the holy grail of 250+ MPG (the maximum that the car reports). When I inevitably get bored of this, I can always remove it from the car and continue to use the battery system for peak levelling some loads, like my home office and living room electronics. If you have been following my blog for any amount of time, you will have noticed that each year I build a bigger and more sophisticated battery than the previous year. The capacity is growing at a rate of nearly 10x per year. I look forward to next year. I do not advise tackling a project like this without the necessary training, expertise, experience and research. Even then, don't try this at home. I was playing with lethal voltages at times and the safety of putting all of this on a wooden frame in a car going down the freeway at 65mph is dubious at best. This is purely a recollection of my own learning experiences and not a guide for you to build your own. Stay safe out there. I hope you enjoyed the read and look forward to your comments. Onwards to more great road trips and fun projects! Wow. Fascinating and very impressive project! What do you think about opening up the usable battery capacity of the ELR? I also have EA 2014 model. Low mileage, but it seemed to have lost a full 1 kWh. I wouldn't toy with the battery tuning performed by GM. They have done extensive cycle testing, at temperature and with car-sized loads. They were able to demonstrate more than 5000 cycles without much loss in capacity because they are staying within the 20-90% SoC range (give or take). My car gets closer to 11kWh in the summer and 9.6kWh in the winter so perhaps you haven't actually lost any capacity and temperature is affecting performance. Internal resistance is higher at lower temperature! Thanks for the invite - I just requested to join. It would be great to find someone to help remove the pack to achieve my dream mod of adding a Leaf pack in parallel to the main pack! Can you directly connect a generator instead of this? Most likely yes. I have seen it done with a Tesla and the resulting fuel economy was around 20mpg. It is impressive that the number was so high given all of the enrgye conversions involved in that process. For the Volt/ELR this doesn't make much sense though. The onboard generator should yield 30mpg+ with ease and if driven gently, maybe more like 40mpg+. What about using a DC generator connected directly to the batteries? I see some 48v DC (alphagen) looks like a honda soo probably it's good. I don't think the output voltage of the generator would have any bearing on the efficiency, but I also don't know all of the generators. I still think the onboard generator would be the best. It has a clutch that can allow engine power to drive the wheels directly at certain speeds which will be the most efficient arrangement (no mechanical to electrical to mechanical conversion losses).